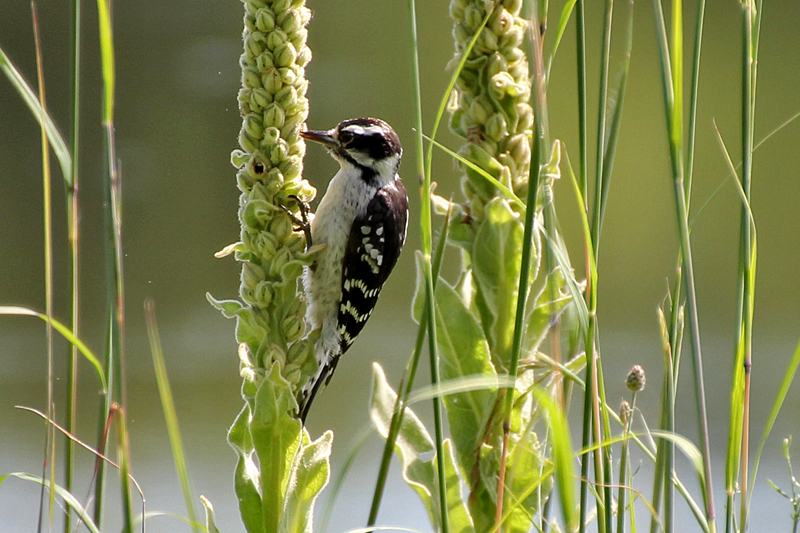 It’s unusual to see Downy Woodpeckers foraging on herbaceous plants in the middle of a prairie landscape, even if the flower stalks do reach 5-6 feet tall. But the mature seed pods of Common Mullein may harbor a feast of insect larvae that Downy Woodpeckers have learned to harvest. This Downy female spent quite a long time exploring every bit of all the Common Mullein flower stalks on a small patch of prairie. She worked around the bottom half of the flower stalks, then flew to the next stalk to start another search. Common Mullein is a fuzzy-leaved biennial weed, introduced from Europe. During its first year of growth, it produces a large rosette of furry leaves, followed by one to several tall spikes of small yellow flowers the following year. Only a few small, yellow flowers open each day (and they last just one day), but the woodpecker isn’t interested in insects on the flowers. Mullein is famous for its seed production — putting out as many as 175,000 seeds per plant. 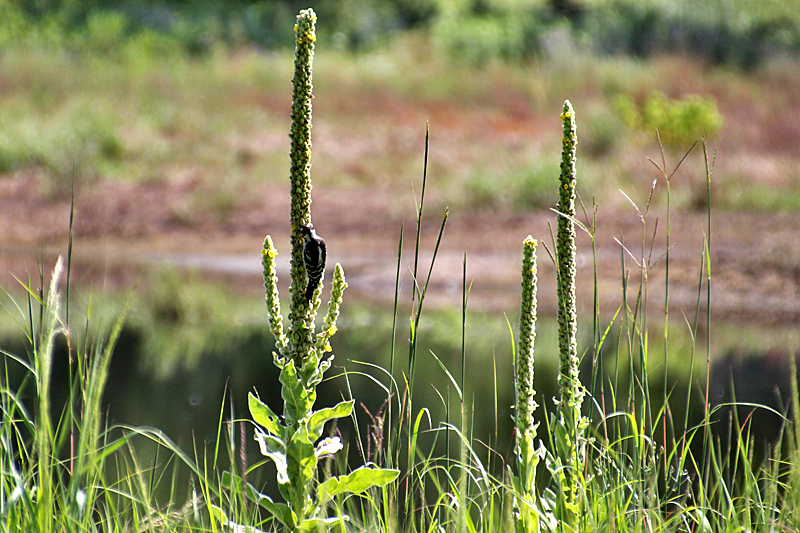 But the woodpecker isn’t interested in eating the Mullein seed either. But that much seed in one place becomes highly attractive to insects, like Mullein Weevils, whose larvae specialize in devouring mullein seeds. Each of the knobby seed capsules that surround the flower stalk harbors as many as 500-600 seeds. A weevil larva develops inside one seed capsule where it consumes 100% of the developing seeds, and finally pupates there. The lower and middle thirds of the Mullein flower stalk seem to suffer the heaviest infestation of weevil larvae, with the top being relatively weevil free. In all, weevils destroy/consume about 50% of the mullein seeds, which still leaves a lot of seed production from just one plant (~80,000!). But without this semi-effective control of mullein seed production, that species would be a lot more invasive. Then as seeds are maturing, along come Downy Woodpeckers who probe the seed capsules for larvae and pupae, thus keeping the weevil population in check. A nice system of biological control at a couple of different levels. This entry was posted in Behavior, Birds, Fruit-Flowers, Insects, Minnesota wildlife, Nature, Plants, Prairie, Weeds, Wildlife Photography and tagged biological control, Common Mullein, Downy Woodpecker, Mullein Weevil by Sue. Bookmark the permalink. This summer, I haven’t seen or heard woodpeckers much–I wonder if they head to a different area or if the leaves muffled the sound of them at work. I really like the little Downy Woodpeckers–they seem so focused and persistent, managing to look cute at the same time. Nice shots of the pint-sized dynamo. Hmmm…I wonder where your little Downys are this summer. They usually stay put in the same area all year. Just quiet I guess. Good information. I didn’t know that the seeds were eaten by weevils. The weevils are apparently the only insect that eats those seeds — pretty specialized! Fascinating story of the interdependence of living things! Thanks, Judy. I can’t take credit for the info. 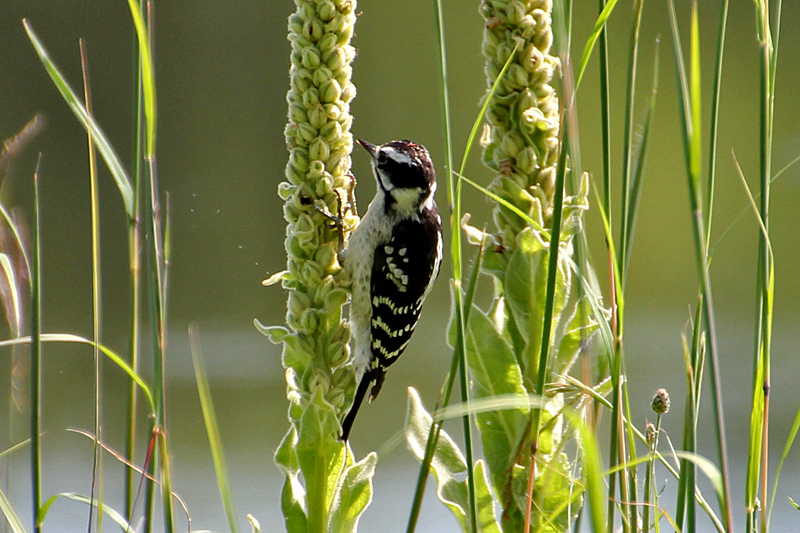 Many others had both photographed and written about downy woodpeckers on Mullein. So I looked up what insect occurred on Mullein and read about the weevils. 2+2 = a good story. I don’t think I’ve ever noticed the Downys doing this. I need to pay more attention – we have plenty of that nasty weed in my area. Great story, Sue. Just noticed this in action for the first time this morning. In my semi suburban/semi rural neighborhood (south of Buffalo, New York), I let a nice, stately mullein grow in my side yard this year, right in the middle of the lawn. I thought the little fellow was going after seeds, but was fascinated to learn about the full story unfolding.